Our History – ASHLAR LODGE, No.3, A.F.& A.M.
Ashlar Lodge, No.3 and its members have a long and honourable history in Nanaimo, B.C. Some of these Nanaimo Freemasons decided to set up a duly recognized Masonic Lodge and petitioned the United Grand Lodge of England for a new Lodge Charter. This Petition was looked on favourably in London and a Warrant was duly issued to Nanaimo Lodge, No. 1090, E.C., which held its first formal Lodge meeting in Nanaimo on 15 May 1867, in a one storey house (long since demolished) on the south east corner of Hecate and Cavan Streets. A Petition for Initiation from Mr. Arthur John Fenny was received at the first meeting. Operating under a Warrant from the United Grand Lodge of England, Nanaimo Lodge, No. 1090, E.C. practiced English Masonic ritual, a situation which displeased some of its Scottish and American members who were more familiar with Scottish ritual and the American ritual derived from Scottish ritual. When the Grand Lodge of British Columbia was formed in 1871, the English and Scottish lodges in British Columbia came under its jurisdiction. Nanaimo Lodge, No. 1090 (E.C.) became Nanaimo Lodge, No. 3, G.R.B.C. while Caledonia Lodge, No.478 (S.C.) became Caledonia Lodge, No.6, G.R.B.C. But the 1870s were a time of economic difficulties on Vancouver Island. The population of Nanaimo was decreasing and it became increasingly difficult to maintain strong membership levels in two separate Masonic Lodges. On 8 December 1872, the Grand Lodge of British Columbia approved the amalgamation of Nanaimo Lodge, No. 3 and Caledonia Lodge, No.6 into a single new Lodge under the name Ashlar Lodge, No. 3, to be based in Nanaimo. The newly formed Ashlar Lodge, No.3 quickly acquired land in downtown Nanaimo for a new Masonic Temple. On 15 October 1873, the cornerstone of the first Masonic Temple to be built in British Columbia was laid by Past Deputy Grand Master John Foster McCreight. A year later, on 21 October 1874, the Ashlar Masonic Temple building, the first Masonic Temple to be built in British Columbia, was consecrated by M.W. Bro. Simeon Duck, Grand Master of British Columbia in the first such ceremony to be conducted in British Columbia. The first Ashlar Masonic Temple was demolished in 1923 and replaced the same year by the current Ashlar Masonic Temple. 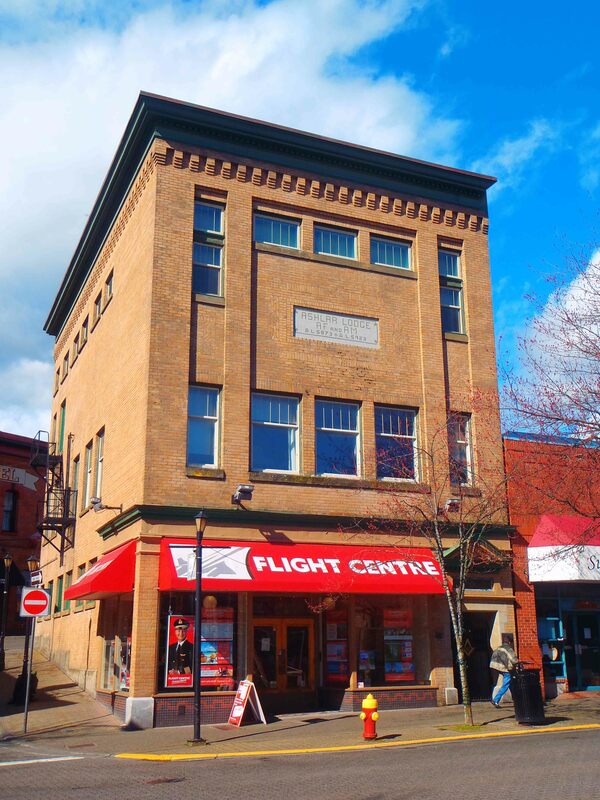 which has become a landmark building in downtown Nanaimo and is also listed on the Canadian Historic Places Register and the City of Nanaimo Heritage Registry. The Nanaimo News Bulletin published a story on the Ashlar Masonic Temple in its 16 February 2016 edition. As a way of remembering our Ashlar Lodge, No.3 history and our Deceased Brethren, Ashlar Lodge, No. 3 will feature a Deceased Brother on the site each month. Our featured Deceased Brother for February 2016 is R.W.B. 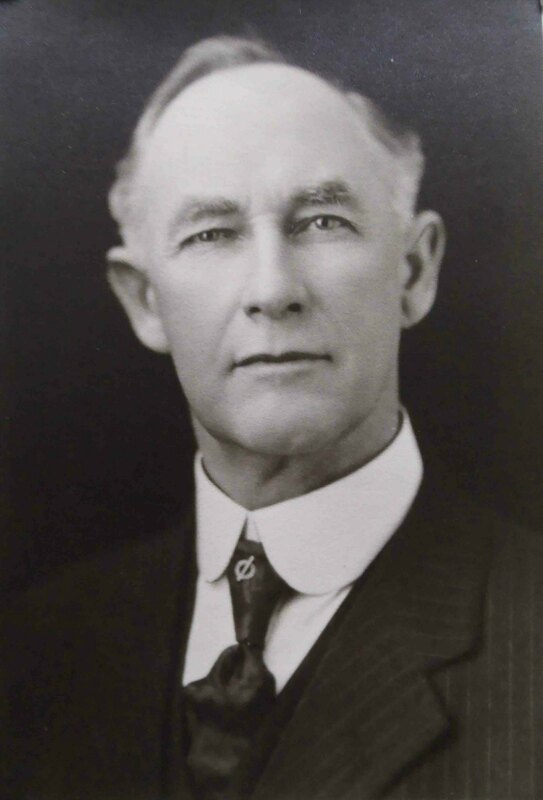 John W. Coburn (1850-1939), the first Mayor of Ladysmith. Find out more about R.W.B. John W. Coburn and his house in Ladysmith, which is still standing.